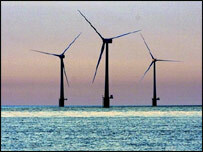 Wind power - use it or lose it? Seamus Garvey wants to "store the wind". He believes the future of energy is storing it as compressed air in giant bags under the sea. And a major power company has invested in the scheme. Professor Garvey, a long-time proponent of compressed air, feels vindicated by the research grant. He said: "As the country and the whole world moves toward using more renewable energy, we're going to need energy storage." His idea would utilise familiar renewable sources - wind, waves and tidal power. But Professor Garvey does not believe we should be forced to "use it or lose it" when conditions are best. Energy would instead be used to compress and pump air into underwater bags, anchored to the seabed. When energy demand is highest, the air would be released through a turbine, converting it to electricty. 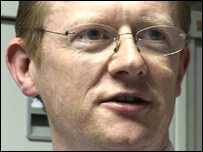 Professor Garvey, from the University of Nottingham, said: "The demand for electricity's not constant. "In the middle of the day we want a lot of it, at night almost nobody wants electricity. "Also, the wind does not blow at the same speed all the time. "We will have times (as wind power becomes more common) when the amount of electricity generated by the wind is more than the total demand for the whole country... then you have to store it or waste it." Power company E.ON has granted 300,000 euros (£236,000) towards building two prototypes - the first on land, then an underwater version powered by waves. Using compressed air to store energy is not new - for example, it has previously been done in disused mines. But Professor Garvey will do it under the sea, in flexible containers he has dubbed "energy bags". He said: "We have to overcome the instinct that (this idea) is too simple to be good. "And then to show that the economics stack up." Professor Garvey anticipates his prototypes will be operating within 18 months.